Most children will have an occasional ear infection. Whilst most recover quickly, a number of children have recurrent ear infections and can develop ‘glue ear’. If this condition persists an option for treatment is grommets. But what are they and how can they help? We’ve answered your most frequently asked questions below. A grommet is a small tube that is surgically placed into the eardrum to treat middle ear conditions. Grommets work by allowing air into the middle ear and drain excess fluid to the back of the nose and throat. Grommets are usually recommended if you’re child has had glue ear for at least 3 months or has experienced trouble hearing. They can also sometimes be recommended as a remedy for frequent ear infections. Glue ear, or otitis media, is a common childhood condition that occurs when sticky glue-like fluid builds up in the middle ear. It can be caused by ear infections, severe colds, allergies and cigarette smoke – children of smokers are often more susceptible. 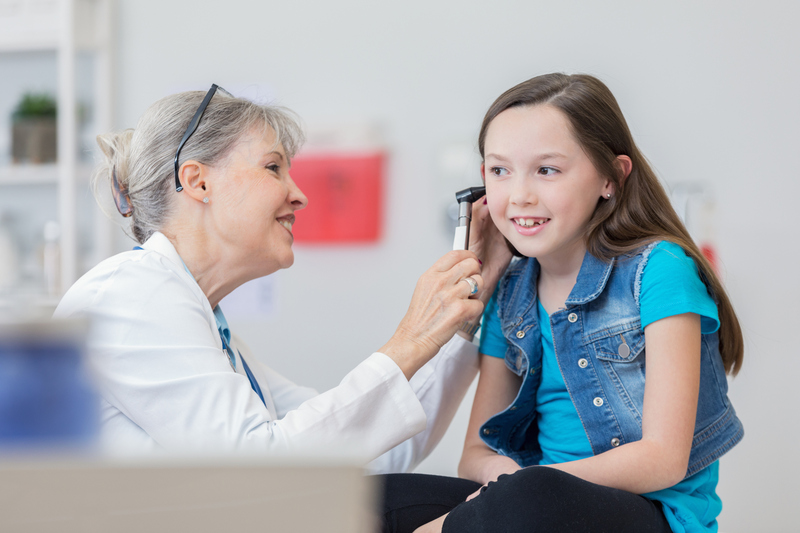 Glue ear dampens the vibrations of soundwaves in the eardrum and in doing so dulls hearing, can affect balance and may result in your child becoming irritable. Glue ear usually gets better on its own however if it doesn’t it can cause hearing problems. When are grommets used and how are they inserted? Grommets are usually recommended if you or your child has been suffering with glue ear for at least 3 months. Grommets can also be used to treat repeated ear infections. They are inserted during a ‘myringotomy’, a minor surgery. It takes about 15 minutes and is performed under general anaesthetic. Hearing is generally restored quickly after the surgery and the grommets themselves will usually fall out on their own within 6 to 12 months, leaving the eardrum unharmed. Are there any complications to look out for? Whilst it is normal for a small amount of oozing or bleeding from the ear in the first few days after surgery, you should be on alert if this continues for more than five days. This could be due to an ear infection or a tear in the eardrum. If there is a lot a pain or you notice prolonged discharge from the ear please contact your doctor. Can you go swimming if you have grommets? One of the most common complication of grommets are ear infections so it’s best to keep your ears as dry as possible. In the week following your surgery you should avoid swimming but after this you are safe to get back in the water as long as you take a few minor precautions. Whilst swimming at an ocean beach is fine, earplugs and a swimming cap should be used in swimming pools to lessen the risk of infection. It’s also recommended that you avoid diving completely whilst the grommets are in place and dry your ears thoroughly after swimming. Are grommets just for children? No – adults can also develop glue ear and may also require grommets as a course of treatment. Bowel cancer on the rise amongst young Aussies – could you be at risk?